In the weeks since Bloodbraid Elf and Jace, the Mind Sculptor became legal in Modern, Wizards has posted some novel and interesting decklists from Magic: Online. As a lover of attacks, blocks, and interaction, the Wild Nacatl decks intrigued me. I’ve never been a fan of the disruption-light Revolt Zoo variants, nor the activated-ability-centric Knight of the Reliquary ones. With Bloodbraid in the picture, though, it seems a more goodstuff-style Zoo deck becomes viable. 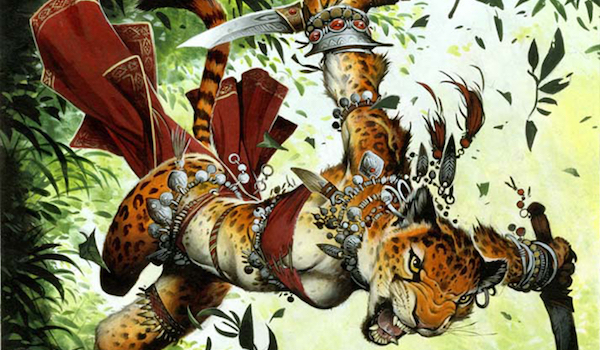 The format is Modern, which means there can’t be a single way to build goodstuff decks. I set out to find a build that works for me. 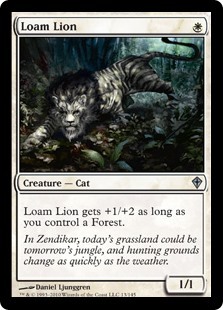 Today’s article focuses on my brewing journey across the Zoo over the past week. Two Tribal Flames-based Zoo lists in particular set off my brewing kick. One, first posted by HJ_Kaiser in a Modern Challenge Top 32, features 12 one-drop threats and Mantis Rider. This deck has gone on to place in a second Challenge and continues to rack up 5-0s. The other has appeared only once so far, in a 5-0 performance by Moosedroppings; this list can be more aptly described as “Little Jund” than as “Big Zoo,” and packs Grim Flayer. Each list featured cards I wanted to cut immediately: worse-Nacatls Kird Ape and Loam Lion out of the Mantis build, and unexciting meta-breaker Loxodon Smiter out of the Flayer build. Mantis and Flayer are both pet cards of mine, so I wondered if I couldn’t fit the two into the same Zoo shell. Color-wise, it seemed ridiculous, but in terms of playstyle, these were the exact creatures I wanted flanking my Wild Nacatls and Tarmogoyfs. The 5-0 decks already ran five colors for Tribal Flames. And I’d even brewed with Mantis Rider and delirium before. Enabling Mantis Rider mostly requires making enemy Lightning Bolts worse. There are a few ways to go about doing so: we can overload the Bolts with cheaper targets, as in HJ_Kaiser’s list; run shields like Mutagenic Growth; or ramp up on targeted discard to proactively strip answers from opponents. Taking the first route seemed like a natural solution at first. After all, Rider gets better in a like-mindedly aggressive deck, i.e. Humans. Grim Flayer‘s constraints are a bit more complicated. Mantis asks us to pack a high density of creatures, but Flayer wants a diverse array of card types. There’s a reason they don’t play this guy in Humans: he’s just not worth two mana without delirium. Delirium gets even tougher with Bloodbraid in the mix, since the best enablers (Mishra’s Bauble; Tarfire) are miserable cascade hits. One route is to ensure the basic types—instant, sorcery, and land—are consistently represented. In a Zoo deck, opponents either deal with the one-drops or lose to them; if they fail to produce a kill spell for Nacatl, Flayer’s likely to do some work even as a 2/2. Another is to run weird card types. Not one to turn down a big Goyf, I started with the latter. This build, as is natural for my first drafts, was all over the place. Delirium was hit-or-miss, often depending on how often I naturally drew Mishra’s Bauble. And it was totally useless in the absence of Flayer, making for some disappointing cascades. Hierarch was great at dying early, but sometimes unimpressive when it stuck. We tend to attack with enough creatures to negate exalted by the mid-game, and don’t really ever need mana in excess of four. Surprisingly, the mana was decent, if untuned. It turns out supporting five colors is feasible on so many lands. I just went with the 13 best-looking fetches to support the shocks I thought were most important. The two big issues with this deck’s mana are the damage it causes and the basic land. We end up naturally putting ourselves to 12 life in many games, which made me wonder if Death’s Shadow doesn’t belong in the deck. Forest is kind of awkward since it doesn’t cast Mantis Rider, but it casts the rest of our creatures, and allows us to operate partially under Blood Moon. Lingering Souls plays the role of midrange trump, and Thoughtseize plugs critical holes against combo (and Tron, as does Fulminator Mage). Mutagenic Growth still embarrasses Lightning Bolt, which is again king in Modern. David may have struggled to fit Death’s Shadow and Bloodbraid Elf into the same Jund shell, but it didn’t take long afterElf became legal online for the combination to put up a win. Keeping this result in mind, I took a minor detour from my original mission to try supplementing them with Flayer and Nacatl. Not that the detour was deliberate; I just quickly found that the Shadow package doesn’t allow Mantis Rider. It’s too card-heavy. Shadow demands 4 Death’s Shadow, 4 Street Wraith, and 4 Thoughtseize. To its credit, though, this package excels at granting delirium. Without Rider, we didn’t want blue at all, so Tribal Flames was also trimmed. Hierarch became less impressive as a result; I cut the mana dork to make room for Wraiths, which fulfill a similar purpose of adding creature to the graveyard. This change also made Pyroclasm more attractive out of the sideboard. This build found itself short on instants for delirium, making me consider adding Manamorphose in place of the goofy enablers I hadn’t yet divorced myself from. But once I did that, I without question had a worse version of Traverse Shadow on my hands. Traverse Shadow isn’t a deck that wants Nacatl over synergistic, matchup-solving bombs like Temur Battle Rage. Taking things one step further, it doesn’t need so many copies of Grim Flayer, as Traverse the Ulvenwald itself is a more rewarding payoff for achieving delirium. So it was back to the Mantis-Flayer drawing board, now with some valuable lessons learned. No Wraith meant a return to Hierarch, and subsequently, a way to use the excess mana. I turned to Scavenging Ooze, an incidental grave-hater with wide applications against midrange decks. Manamorphose and Inquisition of Kozilek made the cut over Seal of Fire and Tarfire for help with delirium. Targeted discard pairs well with aggression. I tried splitting Inquisition with Thoughtseize to free up some space in the board, but it proved too painful. Manamorphose helps cast Mantis and Flayer when our lands aren’t optimal, or through a Moon. The instant was also a fine cascade, as I’d often find myself with more spells to cast in hand; that way, hitting Mana off a Bloodbraid still let me add to the board. After a few matches, I wanted to include more copies of Manamorphose, but lacked space. The Baubles were too important for delirium when opponents didn’t have removal. This fact reveals a key weakness of 2.0: it’s too reliant on opponents doing something. The strength of Modern Zoo is its proactivity. If opponents don’t do anything to interact with us, we shouldn’t be struggling to stuff our graveyard. We should just be killing them. I’d doubled down on Flayer’s tertiary color in the Shadow build, but now found myself dropping it entirely to try a build with only Mantis Rider instead. Striving for delirium over-diluted Zoo’s gameplan. It’s no wonder we’ve only seen a single 5-0 in the vein of Moosedroppings’s Grim Flayer list. Cutting delirium enablers made room for more lackluster cascades. A card that blew me away in each of my Flayer builds was Mutagenic Growth, and I settled on running the instant main to combat Bolt decks. I figured decks omitting Bolt would have trouble dealing with our assault in the first place, and those packing it now had extra hoops to jump through. The exception is opponents aiming to go under even aggro decks, like Storm and Scapeshift, or ones packing sweepers like Surpreme Verdict. Spell Queller gives us game against each of these plans while pairing nicely with Noble Hierarch. It can also be saved from Bolt with Mutagenic Growth, and naturally resists Fatal Push. Finally, Queller contributes to our primary gameplan, combining with the instant to leave opponents with precious few ways to deal with aggression and joining Rider in the skies. The initial build also featured 4 Curious Obsession as a placeholder. I’d seen the card perform in some Spirits lists and wanted to try it with Nacatl, Queller, and Rider, all of which it grows past Lightning Bolt. After about ten minutes of goldfishing, I scrambled to get the cards together and brought the deck to a weekly Modern tournament. The excursion was good for a laugh, but things didn’t quite pan out. On the bright side, I realized what to include instead. For Growth to excel, and my curve to smooth out, I needed more one-drops. But I was still down on Ape and Lion. Axing the couple Botanical Sanctums I started with for more fetches opened up Narnam Renegade, an incidental perfect fit for this deck. Renegade holds down the ground against the likes of Eldrazi, Jund, and Shadow while our evasive beaters soar over the battlefield, mitigating the deck’s lack of Path to Exile (and now, Tribal Flames). It’s also aggressive enough to bait removal. Eight “bad” cascades is about as many as I’m comfortable with. Growth gives us an extra two damage and sometimes further buffs Tarmogoyf, but does so much for us from the hand that cascading into it is far from the end of the world. Queller’s a bit more complicated. It turns our 3/2 haste into a 2/3 flying and insulates us against removal spells, most notably sweepers—should Queller die, we get to cast Elf for free, which again triggers cascade. It’s a shame the Spirit doesn’t boast a “may,” as 2RG for Vulshok Berserker and Talon Trooper is a fine rate. But it’s still a counterspell we can run alongside cascade, and one the deck needs. Tarmogoyf finds itself in kind of a weird space here. It remains the best follow-up to a deceased one-drop, assuring its inclusion. But we don’t grow it larger than 3/4 ourselves. Regardless, Goyf is way larger than its mana cost suggests. I’ve just never so hungrily watched opponents cast Serum Visions and Inquisition of Kozilek. I initially replaced my Curious Obsessions with a 2-2 Narnam Renegade/Goblin Rabblemaster split. Rabblemaster is awesome in this deck, especially against midrange and big mana. Versus the former, it provides a form of card advantage with the tokens, which can chump Goyf, die to Diabolic Edict effects, or crash into freshly-minused Lilianas. But our three-drop slot becomes unbearably clunky with Rabble in the mix, which caused me to max out on Renegade. This three-drop curse plagues other possible options like Tireless Tracker and Reflector Mage. Such tools are probably best relegated to the sideboard. Reflector does indeed find a spot here, replacing Path to Exile so we can run Magus of the Moon. Magus joins our “Thoughtseize,” Unified Will, in hassling Tron. We can’t cascade into Will, but it does outperform Seize in matchups where we want those cards. While I generally love Pyroclasm in this kind of deck, I’ve opted for Kozilek’s Return as extra insurance against Affinity. Crucially, the instant can also be cast on end steps after leaving up Spell Queller for a turn. An unthinkable include for my delirium builds, Rest in Peace also appears here. This card is really gross, but few decks can splash it; fortunately, with only four Goyfs and a couple Oozes using the graveyard, we’re among them. I’ve even used Rest in Peace to dominate the Zoo mirror, turning Knight of the Reliquary, Voice of Resurgence, and of course Tarmogoyf into costly chump blockers. In that matchup, it’s best to board Goyf out, but against decks that just lose to the hoser (i.e. Dredge), there’s little reason not to leave Goyf in. Similarly, discard-heavy strategies against which Goyf is already strong, like Abzan Rock and Traverse Shadow, encourage keeping both. Lastly, I want to touch on this deck’s niche in the Modern metagame. It’s similar to Humans, but less interactive. It’s also worse at goldfishing; in other words, it’s less proactive when opponents let us do our thing. That said, nobody lets you do your thing right now. In the face of disruption, Queller-Cat is significantly more resilient and proactive than Humans, as its threats tend to stand strong alone. Mutagenic Growth also grants us a free win dimension against Bolt decks—few interactive opponents can keep up with a strong curve supplemented by a timely Mental Misstep. And on the note of “playing instants and sorceries,” Queller-Cat expertly wields the best card in Modern, Lightning Bolt. The most obvious draw to this deck over Humans is its access to non-Human creatures. Queller has some coverage with Kitesail Freebooter and Meddling Mage, but does more than either of those creatures by itself, even sapping enemy mana. Scavenging Ooze gives us a much-needed mana-sink, as Humans too is prone to flooding. 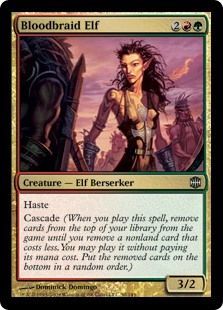 But Bloodbraid Elf is the deck’s biggest gain, providing a Collected Company alternative that sneers in the face of countermagic and doubles our haste creature count. Queller-Cat seems like the natural evolution of Counter-Cat. The prevalence of discard-heavy, Push-featuring strategies is bad news for Delver of Secrets. The nail in the coffin, though, is that permission decks can’t run Bloodbraid Elf, a card aggro-control decks badly want in the aggro-control mirror. Queller-Cat solves that issue without actually curving all its counterspells. In any case, it seems like there are a million ways to sling Wild Nacatl right now. What Zoo decks have you been experimenting with? Let me know in the comments. Minor nitpick – rabblemaster forces tokens to attack so they generally wont be blocking many goyfs. They do after Rabble eventually dies. A great way to kill it is to just turn it sideways. Opponents block or lose. Cascading Elf into Queller is good if you want to proact without overcommitting into sweepers, which is rare. So overall I’d say it’s bad, but passable. Oh yeah! Such is often the case with my brews. If you have an idea, my advice is to just throw a list together, no matter how imperfect, and get testing! The faults will reveal themselves quickly and you can make the changes you need to improve the deck. Brewing’s so fun because you get to experience WHY certain cards, strategies, combinations, etc. do or don’t work in Modern. I really enjoyed reading it because it’s super relateable for me as a competitive Brewer but also very informative to see another person’s solutions to types of problems and where they look for problems. Seeing the failures and lessons and thoughts that lead to the right list is a type of article that I’d like to see more of. Thanks! 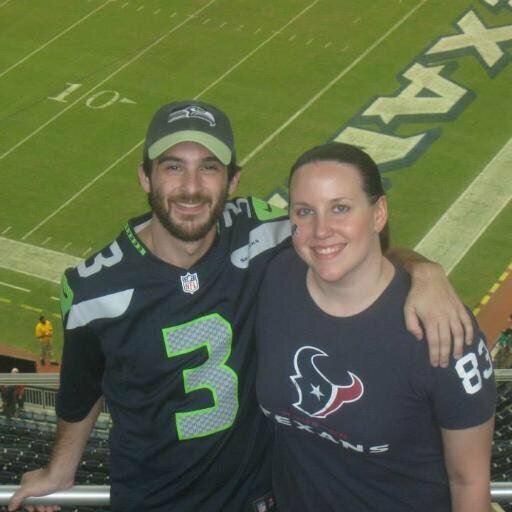 Expect a tourney report on Friday. Congrats on SCG, Jordan! You absolute madman! I’ve been running CES for a couple of months and it’s been one of my most successful and fun runs in the history of Modern. Glad to see it’s still as good as ever post-unbannings!